In 1973 when Der Steiermark was built, many of the old buildings on Main Street had yet to be brought into the 20th Century, and the town lacked commercial space. This sleek building was tucked a half block off Main Street, on a wide, slow spot in the Blue River that is called the Skelly Pond, because a Skelly station was on Main Street in front of it. Today, the Der Steiermark condos for sale are home to 20 small condos that are still just steps from Main Street, backing onto the pond and are primarily known as the building that houses the long-time Mexican Restaurant known as Mi Casa. Der Steiermark was remodeled in 2002, to keep its façade up to date, and to make it easier for homeowners, and sunlight to reach the condos. You can find out more about this condo community, or check out the available Der Steiermark condominium listings below. From Der Steiermark, cross the street and head under the archway of the Village at Breckenridge. Cross the long plaza and at the end of it you will see people stepping out of their skis. This is the Peak 9 base area, and just a few quick glides on your skis and you’ll enter the maze for the Quicksilver Lift, which will take you to the top of Peak 9. A little larger pond on the Blue River is located next to the Village and there is paddle boating in the summer and ice skating in the winter on this pond. The trailhead for the Burro Trail is just up the hill from the Quicksilver and gives easy access to miles more of trail in the national forest. 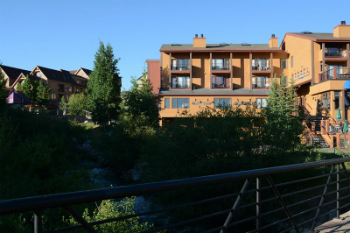 Amenities: on the pond, above MiCasa, at the heart of town. Remodeled recently. You can contact us online, or by phone at (970) 453-2200 to get more free information about the local Breckenridge real estate market.